An incredible pub fare to fit your lifestyle. 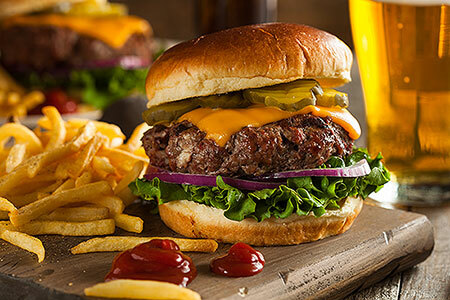 All beef burgers are custom blended ground chuck, brisket and short ribs and are cooked in cast iron skillets to seal in the natural juices; served with crispy fries or cole slaw and a pickle spear. PLEASE ORDER BURGERS EITHER “SOME RED”, “SOME PINK” or “COOKED THROUGH”. With onions, cheddar and mushrooms flambéed with a shot of bourbon. All items slow smoked with hickory wood in our Southern Pride Smoker. Includes choice of two sides. ... to have a Party with us? 12 years or younger please. All kids meals come with soda and cotton candy.